Offering you a complete choice of products which include fasteners and ms wire nails. 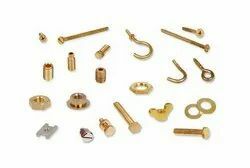 Moulding insert, Screws, Brass terminal, Knurling Inserts, Grub Screw, Stud, Washer, Nuts, Rivets, spacer, standoff, Brass fasteners, Brass wing nut, Brass energy meter screws, Brass Pillers, Self tapping screw, Bolts ets..
We also developed fasteners as per customers Specifications..
With our rich industrial proficiency, we are engaged in offering superior quality MS Wire Nail. The offered nail is developed and designed using quality accepted raw materials and advanced technology.